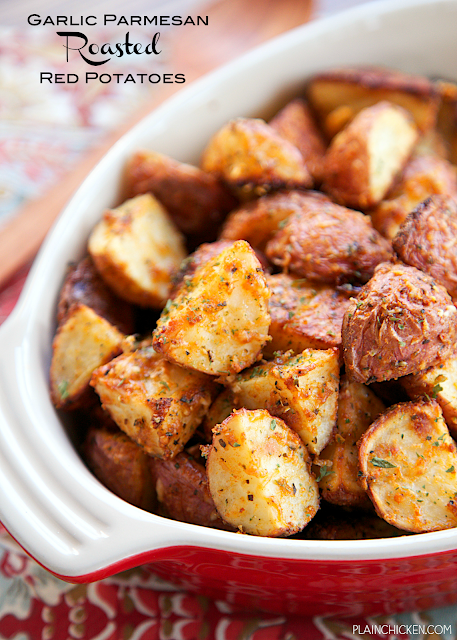 Garlic Parmesan Roasted Red Potatoes - red potatoes tossed in garlic, onion, paprika, Italian seasoning and parmesan cheese - SO delicious! A super quick and easy side dish. Ready for the oven in minutes! Great with burgers, chicken, steak and pork. The whole family loves these yummy potatoes! 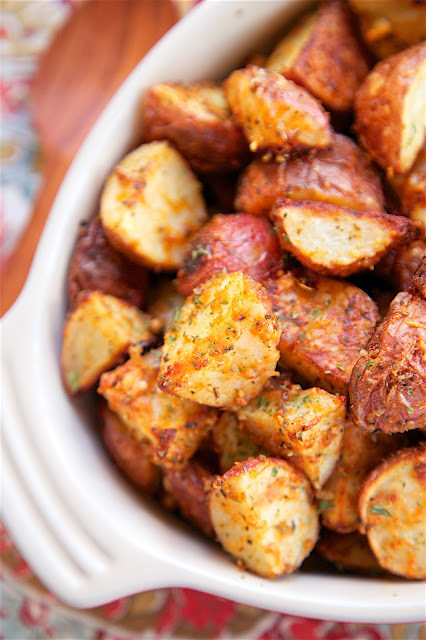 These Garlic Parmesan Roasted Red Potatoes are off the chart delicious! The best part about these potatoes is that they are super easy to make. Just chop the potatoes, toss in oil, seasonings, and Parmesan cheese. The potatoes were ready for the oven before it preheated. I love these quick and easy side dishes!! 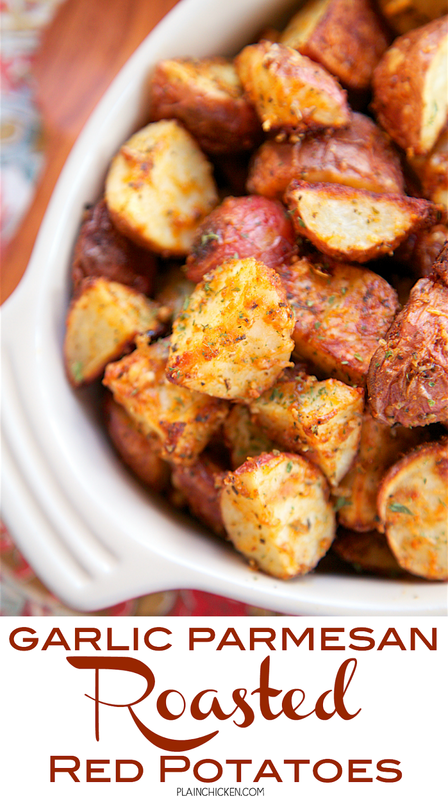 These Garlic Parmesan Roasted Red Potatoes are a great weeknight side dish. They go great with burgers, hot dogs, chicken, pork or even steak! I throw a batch in the oven when Chicken Legs stars the grill and dinner is ready without a lot of effort. Love it! In a large bowl, toss potatoes with olive oil, seasonings and parmesan. Toss until potatoes are evenly coated. Spread potatoes in a single layer on a foil lined 15x10-inch pan. Bake, uncovered, for 45 to 50 minutes. So simple and delicious! I will definitely make these! I gave these a try tonight and they are amazing. Having these again tonight, the first time I made them, my guy said "these are the best potatoes I have ever had." They smell so good when they are cooking and taste even better when they are done! Do you use fresh grated Parmesan, or the Kraft grated Parmesan? Either is fine. I usually use fresh grated, but I've used the canned cheese and it is fine. Enjoy! Can you do these on the grill? It's a bit warm out to have the oven on. Awesome recipe and like the others have said, it's so simple. I have to say, however, that for 14 red potatoes, you need a lot more of the seasoning than the recipe calls for. One teaspoon of garlic powder for a recipe that is called"Garlic..." is just not enough. But, like all recipes like this, I would season to "taste" rather than following the strict measurements.